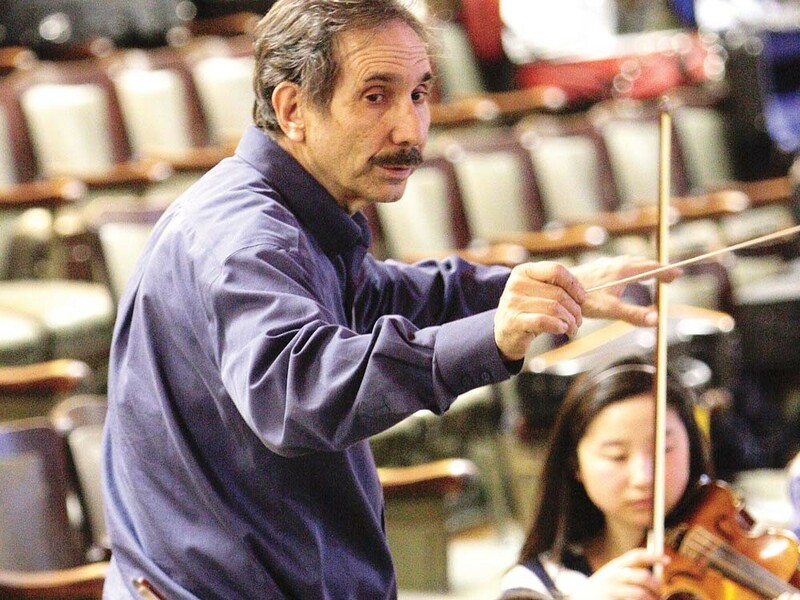 Verne Windham's 15-year tenure as director of the Spokane Youth Orchestra comes to an end this week. 'I came for a night and stayed for 15 years.' Verne Windham at one of his final orchestra rehearsals. "Glorious." If Verne Windham, the classical music voice of KPBX and conductor of the Spokane Youth Orchestra, has a favorite word — a signature word — this is it. The music is glorious, the musicians are glorious, the effort is glorious. But now, the era ends. Following the SYO’s final 2010-11 concert at the Fox on Sunday, Verne Windham will pass on his baton. He’ll then bring each senior to the stage — one by one — and he’ll have something personal to say about each. He will tell their stories, speak of their time in SYO — their triumphs and their challenges. He’ll make mention of their post-high school plans. He knows them like family. All 32. Strange circumstance brought Windham to the orchestra. Two weeks before a scheduled concert back in 1996, the orchestra’s conductor suddenly quit. Just like that. Windham wanted their SYO experience to be challenging, to “learn how to get the job done.” But he also knew that social interaction was part of the gig. He would keep things light, but focused; he would challenge and praise performance and demand professional protocol, all the while showing understanding. Ryan Jacobsen, a 2011 concertmaster, speaks for many when he says that he will always remember Windham’s hilarious sense of humor. Four years later, in 2000, Windham confronted his most serious challenge. In mid-April, the SYO had just performed a memorable concert at St. John's Cathedral featuring SYO concertmaster Jason Moody, who today performs with the Spokane Symphony Orchestra. * A week later Windham felt a lump on his neck. Surgery was immediately scheduled in Seattle. Follow up radiation treatments were prescribed. He would be limited for several weeks, a time when SYO had two concerts scheduled — the organization’s 50th Anniversary concert, followed by the season finale. The Spokane music community rallied. Long-time Spokane Symphony Director Donald Thulean, who was scheduled to conduct part of the anniversary concert, did that and much more. Marty Zyskowski, former SSO principal timpanist, helped out with rehearsals. Windham managed to conduct one piece. Zyskowski then both rehearsed and conducted half the finale concert. By August, Windham was feeling much stronger. He has been clear of cancer ever since. Over the following years, Windham continued to raise the bar. He programmed in more complete symphonies. Auditions became more formal and frequent. Today, SYO re-auditions seating assignments in the string sections three times a year. Along with raising the level of proficiency, Windham moved to expand SYO’s repertoire. Kim Houglum, who performed as concertmaster for four of her six years in SYO, asked Windham if he could list for her all the pieces they performed while she was in the orchestra. On the list are more than 70 compositions performed from 1998 through 2004: Bach, Beethoven and Brahms all appear on the list; so, too, do Rimsky-Korsakov, Elgar, Prokofiev, Haydn, Dvorak, Berlioz, Schubert, Holst, Kabelevsky, Shostakovich, Tchaikovsky, Stravinsky, Barber, Bernstein, Mozart, Sibelius, Grofe and Ravel. Several local composers — Don Caron, and William Berry, to name two — are also on the list. At one point, Windham decided that the SYO needed a signature piece that every SYO member knew. Kaylee Wood, double bass player and 2011 concerto winner, observes that the Beethoven: Symphony No. 5 in C minor became that piece. “I’m pretty sure we’ve played it every year since, forever,” she says. Windham confirms Wood’s impression, and points out with satisfaction that he is using Gunther Schuller’s notations, which are Beethoven’s original. Above all, Windham would always push his kids to take chances. For example, in 2004, when my son Timothy was in the SYO, Windham programmed Richard Strauss’ tone poem for large orchestra, the demanding Death and Transfiguration. This piece is 24 minutes of irregular rhymes, with horns for minutes on end playing in the highest registers. It’s as much of a physical drain as it is a musical challenge. “Going into the 2003-04 year, I knew that I would have the two things I needed,” he recalls. “I would have depth in every section, and I would have an unusually high number of kids who had cross-trained on piano." Need for depth in a big piece such as this is easily understood, but why was piano training so important? “Piano training produces musicians,” he says, “not just instrumentalists.” Windham has made an important, but not obvious, distinction that he then builds on. On taking over in 1996, Windham soon realized that, to keep their attention, these young musicians needed to be challenged. He had to increase the number of performances and feature serious music. “These young people will only practice the same pieces so long before they get bored,” he says. When he arrived at SYO, the orchestra performed only three times a year; today, they perform six shows a year. He also began to program complete symphonies — now three a year. Adding to the orchestral opportunities and interest is the annual SYO concerto competition. The rules are simple: Contestants perform a single movement from memory (with piano accompaniment if desired). A panel of outside judges hears the finalists (this year, 11 were chosen from the original group of 21 who entered the first round). Three winners were chosen, and they each get to perform their respective movements with the full orchestra at one of the two May concerts. Kaylee Wood, double bass, and Natasha Black, piano, performed beautifully at the May 1 concert. At the upcoming finale concert, DongGyun Kim, the third of this year’s winners, will play the Elgar: Cello Concerto in E minor. And after Kim plays, Windham will introduce his seniors. The SYO will then perform Gustav Holst: The Planets. He’ll lower his baton and motion for his kids to stand to acknowledge the applause. Then, a turn and a bow — for the last time. The Spokane Youth Orchestra’s season finale, “Bon Voyage, Verne” • Sun, May 22, at 4 pm • The Fox’s Martin Woldson Theater • Tickets: $15 • 624-1200. *A previous version of this story incorrectly conflated SYO concertmaster Jason Moody with SSO associate concertmaster Jason Bell.